Kroke ? A Krak?w instrumental ensemble of the world music genre. The band's name in Yiddish means Krak?w. The band was founded in 1992 by three friends and graduates of the Academy of Music in Krakow. 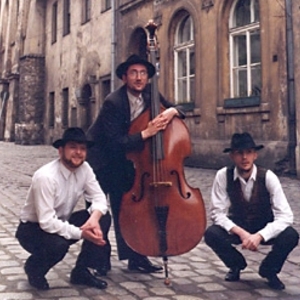 Initially, they were associated with klezmer music with strong Balkan influences. Currently, their work draws inspiration from a variety of ethnic music and sounds of the Orient (especially on the album Seventh Trip), combining these with jazz to create their own distinctive style. In recent years, in addition to their own projects, KROKE has also recorded albums with artists such as Nigel Kennedy, Edyta Geppert and Maja Sikorowska. The first official release from KROKE was the 1993 cassette ?Klezmer Acoustic Music?. During a promotional concert for the album, the band met Stephen Spielberg, who invited them to perform at the ?Survivors Reunion? concert in Jerusalem, Israel and during the Polish premier of the film ?Schindler's List?. In 1996, the band signed with the German record label Oriente. The first album of material, released the same year, through this collaboration was ?Trio?. Upon the invitation of Peter Gabriel, KROKE made their first appearance at the WOMAD festival in July 1997. As a result, joint recording sessions at Real World Studios with other musicians led to material from the band being subsequently used by Peter Gabriel on his album ?Long Walk Home: Music from the Rabbit-Proof Fence?, the soundtrack to the film of the same name. In the same year, KROKE released their second full-length album ? ?Eden?. The following years saw the band constantly touring, during with time they participated in such prestigious music festivals as: Folk?Music?Festival?Umea, Sweden;?City?of?London Festival,?UK;?Forde?Folk?Music Festival,?Norway,?North?Sea?Jazz Festival, the Netherlands?as well as many?others. ?During this time, the albums ?Live at the Pit? (1998 ? nominated for the German Record Critics' Award -"Preis der Deutschen Schalplattenkritik" in 1999) and ?The Sounds of the Vanishing Wold? (1999 ? winner of the German Record Critics' Award in 2000) were released. In 2001, KROKE began collaborating with Nigel Kennedy, the result of which was the album ?East Meets East?, released in 2003. During the same year, the band released ?Ten Pieces to Save the World? as a trio. This album went on to rank number two in the World Music Charts. Along with Nigel Kennedy, the band once again performed at the WOMAD festival in 2004. The same year, KROKE received a nomination in the World Music category from BBC Radio 3 for the album ?Quartet ? Live at Home? (with Tomasz Grochot on drums, who went on to tour with the band over the next few years) as well as working with Edyta Geppert, which would later bring about the joint release ? ?piewam ?ycie? (2006). At the same time, a project was begun with the Sinfonia Baltica orchestra, entitled ?KROKE ? symfonicznie?, conducted and arranged by Bohdan?Jarmo?owicz. In 2006, KROKE's song ?The Secret of the Life Tree? appeared on the soundtrack to David Lynch's film ?Inland Empire?. Another original album entitled ?Seventh Trip? was released in 2007. 2008 was filled with concerts in Poland and throughout Europe as well as work on an "intimate project? arranged by Krzysztof Herdzin, which premiered in Spain with the ?Sinfonica de Burgos? orchestra conducted by Javier Castro. Performances of this project played in Krakow and St. Petersburg in Russia with the accompaniment of ?Sinfonietta Cracovia? conducted by Robert Kabara. Released in 2009, the album ?Out of Sight? was a kind of return to roots for the band. The musicians returned to working as a trio and their concerts took on a more intimate nature. In 2010, they began work on a collection of Greek songs with Maja Sikorowska as well as performing concerts together with the Norwegian band ?Tindra? and Spanish violinist Diego Galaz. Other special events that year included the recording of music for the film ?Streetcar Memories?, directed by ?ukasz Czuj (the film played at the opening of the Schindler Factory Museum in Krakow), and participation in the ?Kennedy's Polish Weekend? at the Southbank Centre in London alongside Nigel Kennedy. In the same year, KROKE performed at the ?Schleswig Holstein Musik Festival? in Germany and took part in the concert ?Your Angel's Name is Liberty?, directed by Robert Wilson, on occasion of the 30th anniversary of Solidarity in Gdansk. n January 2011, the collaboration album ? ?piewam ?ycie? with Edyta Geppert was certified ?gold?. That same month, KROKE along with Maja Sikorowska completed work on the album ?AVRA?, which contains 12 Greek songs. This project also involved guest percussionist S?awomir Berny. In the same year KROKE & TINDRA released album "Live in F?rde" - the recordings were made in the auditorium at "F?rdehuset" on July 10th 2010 for NRK's radio P2.